Search Results for: "john joyce"
Stay Calm is coming soon! Jen has been kind enough to post on our behalf about the upcoming STAY CALM: Celebrating the life of Shannon Larratt memorial here in Philadelphia, but since I’m going to be posting on ModBlog when the whim strikes (mostly history content. There’s no school like the Old School) I figured now would be as good a time as any to post my first post and what better subject than the event that’s coming up soon! The Philadelphia area IAM community- known for the last 13 years as ‘the Weirdos’- were always one of the most active IAM groups and when our friend passed away, we decided to throw a small get together to say our respects and our goodbyes. We figured that we’d get around thirty of our old friends, kick back at a bar and tell some stories and raise our glasses. It’s sort of grown beyond thirty people; to date there are slightly over 200 folks making the trek to Philly by car, bus and plane. The Stay Calm planners have arranged a full day of fun- a family friendly park visit on the morning of 27th April leading into a wild night at Philadelphia’s only Leather Bar (which is owned by IAM members) that’ll feature raffles, drinks (both virgin and alcoholic) and a whole lot of fun. Once we saw how many people were coming, I reached out to our amazing friends and asked for goodies that we could raffle off- with 100% of the profits going directly to Ari Larratt. They responded generously. 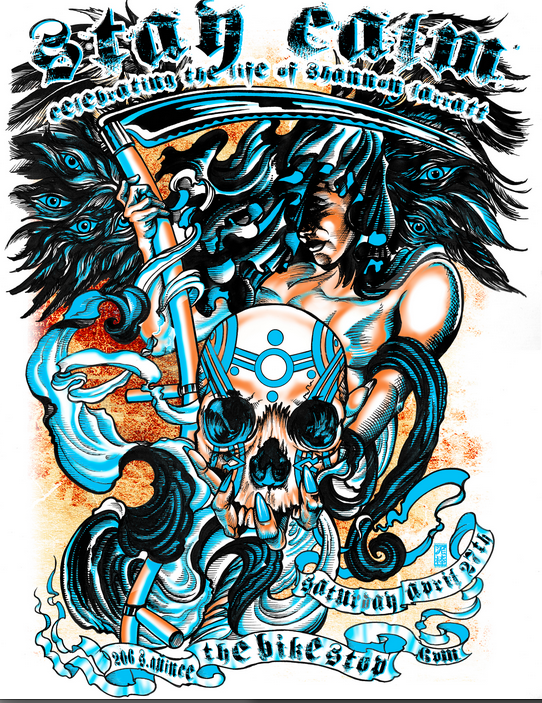 We’ve also got an AMAZING 18×24 hand screened print (printed in Philadelphia by Awesome Dudes Printing) by legendary poster artist Johnny Thief (pictured above) for sale, and again- 100% of profits go directly into Ari Larratt’s savings account. If you’ve never been to a BMEfest, Bowling with Weirdos, East Coast BBQ- the events that helped shaped the IAM community- we’d love it if you could make it out and see what all the fuss is about. If you haven’t been to one in years… now’s the best time to come back home. We have a Facebook RSVP page here that has up to date information on room and ride shares, local Philly tourist information and more as well as our event specific Stay Calm blog. Thanks for having me here on ModBlog, and I’ll be seeing you all real soon! 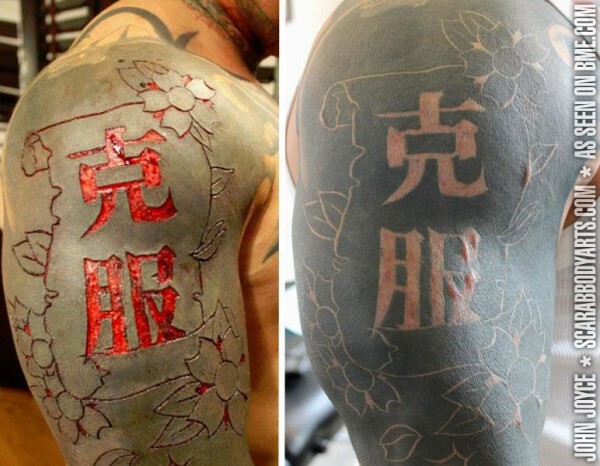 Scarab Body Arts‘s John Joyce (scarabbodyarts.com) has oft been featured on ModBlog (including a long interview back in 2008), but given that I’m posting scar follow-ups today, it’s a good time to feature more of his top-of-the-line work, fresh and healed. The first piece shows the scar at four months (the wearer has been previously featured here and here), and the second at seven months. PS. Do take the time to browse his earlier ModBlog mentions for mountains of similarly brilliant work. You won’t regret it! And you’d be smiling too if you’d just gotten pierced by John Joyce. And besides, there’s nothing wrong with a pretty girl smiling. 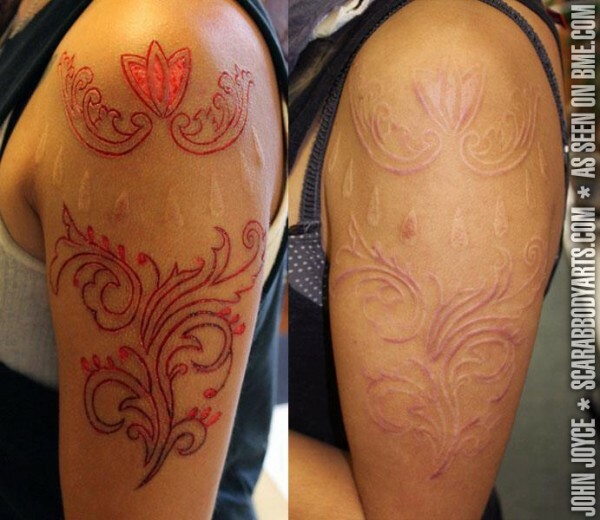 I’ve seen quite a few scarification pieces over the years, and yet I still am amazed when I see something by John Joyce. He’s a master of the blade, and it shows in every scar he cuts. Sale ends May 11th! Check here for details! I love waking up to find John Joyce images in the galleries. Especially when it’s of healed scars. Here’s how the scar looked fresh when I posted it last November. And in case you missed it yesterday.. we’re giving away free stuff all day today! Back to the good ol’ U S of A for this scar by the legendary John Joyce. John works out of his studio, Scarab Body Arts, located in Syracuse, NY.